Kevin Montoya 26:28 (20lb vest), Rob Miller 26:50 (20lb vest), Carey Kepler 28:17, Lance Cantu 30:07 (20lb vest), Michael Giardina 32:44 (20lb vest). U.S. Army Sergeant Jason "Mick" McCluskey, 26, of McAlester, Oklahoma, assigned to the 27th Engineer Battalion, 20th Engineer Brigade, XVIII Airborne Corps, based out of Fort Bragg, North Carolina, was killed on November 4, 2010, when insurgents attacked his unit with small arms fire in Zarghun Shahr, Mohammad Agha district, Afghanistan. He is survived by his son Landen, and his mother Delores Olivares. First upper body workout since tissue tear in elbow. 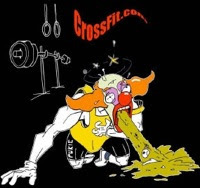 I didn't get to do the WOD today, home with Jake he was sick.